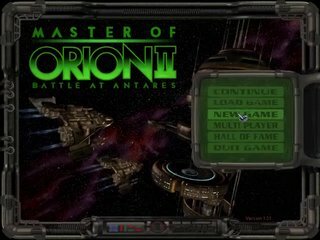 Released for the PC in 1996 by SimTex, Master of Orion 2 (MOO2), sequel to the popular Master of Orion, is a classic turn-based sci-fi 4X game with the objective of becoming the ruler of the galaxy. The game has 3 endings depending on which way you become galactic ruler (elected, attacking interdimensional aliens, or conquering all other races in the galaxy). The main problem with MOO2 was that its success spawned MOO3, which many fans of the Master of Orion series like to pretend never existed. Best small galaxy time with a custom race, easy difficulty: single-segment 0:00:39 by Robert 'DrRob' D'Ascoli on 2009-04-10. A bloopers file is also available. "What's worse than the total annihilation of your star system?" "The pop up message telling you it happened"
Again, Thanks to Pendrokar for his advisement with strategy, tech choices, and keyboard shortcuts. I had always thought feudal was the worst pick in the game, but it's perfect for an advanced tech speed run and to everyone in the tech forum helping me record and encode the run. Also, uber thanks to Hugo123 for telling me about 'Z' auto combat (fast auto combat). Thanks to my wife for putting up with all the hours spent on "that game." Then, when I realized how exploitable advanced tech start was(see notes later), I said "Under 5 minutes"
Then, when I realized how much time I wasted with a non functional wireless mouse (I thought I was a recording complication that couldn't be over come, it was just a dead battery) I said "Under 3 min". Then, when I learned about instant combat I said "1 min or faster". Then, after I set the record, I got paranoid that someone would be gunning for the top spot. (I'm glancing in your direction Kareshi). So I improved my 0:0:59 to 0:0:39. I had planned on doing this Billy Mitchell style (see King of King if you don't get the reference), waiting for someone to top my old time. But, this is my best effort. If someone tops it, they deserve to get the top spot. The run you've witnessed is not how this game was designed to be played; it's supposed to be massive fleets against each other in crazy Borg like Federation battles for galactic supremacy. If High Score was a category, I would totally do a high score run, but it wouldn't be "speedy"
I have a run done on impossible before I knew about fast auto combat, its 50 seconds slower, but more fun to watch, and you can get some idea of what my ships are doing during auto combat. If SDA adds a category of "no fast auto", it could be submitted under that. I had planned to do an audio commentary, but I would have to talk like the "Micromachines" guy to get it all in during the run. Moo2, for those who aren't familiar is a very configurable game, from starting technology, to universe age, to even the race you play. There are 8 Standard races with Positive and Negative attributes, but the beauty of Moo2 is that you can customize your race with the entire set of Positive and Negative abilities from all Races. The lower your percentage (more + traits), the lower your score at the end, and vice versa. If there were to be other "categories" of run, a 200% run (more ? than + traits) and a 300% run (only negative abilities). I chose 100% for the run because that's what the standard races are defaulted to. You could also do more players and larger galaxy size, but that could only lengthen the game. Originally, I went with Telepathic/+2 industry/Rich home world/+50% attack/large home world(only chose it to get to down to 100%), Feudal/Low G Home world (as only my home colony planet mattered). Telepathic lets me mind control a planet after I destroy their stellar defenses. You can't use mind control on other telepathic races, so the portrait I select is that of the only natural telepathic race, ensuring I don't get them as my random opponent. +2 industry/Rich home world lets me modify my ships a few turns faster than not having it. The "time" it takes in hitting the T Key to advance turns is nominal, but the turns that pass allow for the computer to tech some more or build more ships, so faster is better. +50% allows my ships greater chance to hit, dealing more damage, killing faster, thus taking less damage. I went with Telepathic/+1 industry/Rich home world/+50% attack/Transdimensional, Feudal/Repulsive. Transdim lets me move 2 units faster than my current technology. This means if I see an enemy fleet is "3 Parsecs (turns) away", my ships can hit up to 3 colonies 1 parsec apart or less. AND transdim gives my ships +5 to initiate (who goes first). It also gives +5 to my ships initiate. This is imperative because if the computer goes first, I have to sit through their attack animations before I can hit Z to fast attack. In order to make up the 5 picks to snag Transdim, I built a new race that had +1 to production instead of +2 (marginal difference between turns to refit ships). Large home world was a filler pick to get me down to 100%, and I took repulsive over low G to give me more negative points (-6 vs. -5) and I get a greater change of NOT getting colony leaders. (They give bonuses to your planets and ships, which during a "real" game are invaluable, but are only a run ender for me as I have to manually hit the "Reject" button. I use keyboard shortcuts whenever possible like D to design the ships, R to refit them, T for next turn and Esc to get to the galaxy menu, and F1 to select my fleet. Because the galaxy is small, I already start with multiple colonies, and if those colonies are next to my enemies, I see the enemy, and ALL of their star systems. No scouting, saving time. No need to research fuel cells as distance counts from closest system or outpost, and when I take over their colony, my distance start from there! The key to victory? Advanced Tech level start! It basically gives me all the techs I need that I could never have researched in time with the Feudal government, and a pre-made (albeit suckey) fleet. I think this was implemented poorly by the designers, as if the were to be played from pre-warp (no starting tech) there could be no possible way to amass all those techs with a 50% penalty to research. It should have been programmed, "Taking all research racials into consideration from turn 1 to X how much research could have been done?" And then, randomly distributing those points. Simtex would get right on a patch for this if this game wasn't over a decade old and they were still in business. Well whatever, my gain. 2nd key to victory? Miniaturization. Miniaturization is the ability for any weapon that has gone up one rank in field tech (1st branch of physics to 2nd branch of physics for Laser canon) becomes smaller taking up less space so you can pack in more an do more damage, and you can augment them with customization, taking up more space, but having additional properties. Laser cannons (awful base weapon) with the +50% attack (from race bonus) , +25% continuous mod, + auto fire mod (auto fire, give 3x the shots, but at -20% to hit per shot, so race and continuous put all shots at around 100% to hit ? enemy defenses) + no range dissipation and armor piercing mods + ship computer (based off computers branch, anywhere from 25% to 75%) I was basically 1 shoting everything in my path. And this time around, I realized that I no longer need the strongest fleet to have the fastest fleet. After I discovered fast auto combat, the difference between a battle that lasted 2 rounds (30 seconds) and one that lasted 8 (3 minutes) was the same! So all I needed to do was make sure I built ships that destroy the enemy fleet before they destroyed mine. Since they became my colony after defeat, all my ships would be repaired to full, so they could take 99% damage each fight, and still be just as battle ready for the invasion next turn. All my combat is done automatically to save time. The only way I know if I won or lost is if the "Planet Invasion" menu comes up or not. I need to have one of my larger ships alive after the battle to MC the planet. The little ship in my fleet adds nothing, but the time it takes to deselect it isn't worth it, it usually dies after the 1st battle anyway. Often my run would end before it stated when I hit the C button to get to my colony screen right after naming my first System, I would hit it so fast that the game would register the animation and sound, but not bring up the screen. Not much to say really, this was about as near perfect a run as I could do. I think my T mashing to build my ships was the fastest ever. In order to get the fastest time, I needed to have the fewest number of planets/star systems to attack and the best route to attack them. I determined that the fewest attackable (i.e. reachable) star systems a computer will have is 4. If they have 4, it's almost guaranteed that 1 or 2 systems will have 2-4 planets in it. It's actually faster to attack 2 star systems with 1 planet each than 1 system with multiple planets, as key shortcuts are simpler for selecting the fleet and moving over the map. I love it when the enemy sends their entire fleet to a location, saves me the time of having to fight them in orbit of their planet. If they research assault shuttles, the fight can take 3 seconds with fast auto. I expected at least 1 of their systems to have more than 1 planet. Again, the game loves giving that last tech even though I've already beaten it. For those who see the vid and think "He didn't even do anything, that's so easy" That 20 second improvement took me over 650 run attempts. It got to the point where 25% of the time I would beat the game in under 45 seconds, watching the final cinematic was a chore, but my goal was under 40. So as a bonus, I joined all these runs together and recoded them at 5x speed. I call it "Hours for Seconds. 655 attempts of Fail." I had recoded it at 20x speed (From 5 hours down to 15 minutes) but it was too dizzying to watch.